Product prices and availability are accurate as of 2019-04-10 22:48:31 EDT and are subject to change. Any price and availability information displayed on http://www.amazon.com/ at the time of purchase will apply to the purchase of this product. "The SFPG1320C is a Cisco GLC-LH-SMD compatible fiber transceiver module that has been designed, programmed and tested to work with Cisco brand switches and routers. It delivers dependable 1 GbE connectivity over fiber cable, for 1000BASE-LH compliant networks, with a maximum distance of up to 20 km (12.4 mi). Technical Specifications: Wavelength: 1310nm Maximum Data Transfer Rate: 1.25 Gbps Type: Single Mode Fiber Connection Type: LC Connector Maximum Transfer Distance: 20 km (12.4 mi) MTBF: 2,722,277 hours Power Consumption: Less than 1 Watt Digital Diagnostics Monitoring (DDM): Yes This SFP fiber module is hot-swappable, making upgrades and replacements seamless by minimizing network disruptions. StarTech.com SFPs All StarTech.com SFP & SFP+ transceiver modules are backed by a lifetime warranty and free lifetime multilingual technical support. 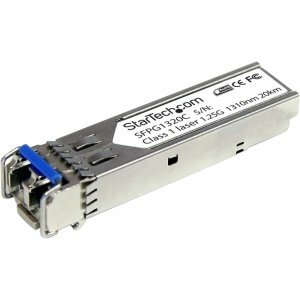 StarTech.com offers a wide variety of SFP modules and direct-attach SFP cables, providing the convenience and reliability you need to ensure dependable network performance. " Add, replace or upgrade SFP modules on Gigabit fiber equipment LC SFP Transceiver / Cisco Compatible Gigabit Fiber SFP Transceiver Module SM LC w/ DDM 20 km (Mini-GBIC) / 1000Base-LH SFP / Single Mode SFP / 1310nm SFP / Fiber SFP Module / Cisco Compatible Transceiver SFP Fiber Transceiver / Single Mode Fiber SFP Module Equipped with an industry standard single-mode LC interface Extend your network connectivity up to 20 km Complies with SFP Multi-Source Agreements standards (MSA) Look for "Ships and Sold by Amazon" to ensure you are receiving genuine StarTech.com product. Genuine products come in StarTech.com packaging.